Imagine being at work when you look out the window and see a huge orange glow coming from the direction of where your house is located. Then you hear on the news that there is a huge fire destroying homes in the same area. In this SHTF scenario there will be tons of thoughts running through your mind at a million miles per second. This is exactly the situation that many Canadians found themselves in as Fort McMurray burned to an unrecognizable smolder. At least 88,000 people were forced to flee from their homes. These people had to race from their places of work to gather family and belongings in an attempt to quickly leave the area. However, it wasn’t as quick as these people would have hoped. Many of them were stuck in traffic as the fire burned more than 210,000 acres. That is 10 times the size of Manhattan. Unfortunately this last minute exodus left many stuck in traffic for hours. Some were still in traffic within the city limits until 3am. You could even spot some people on bicycles as alternate methods of transportation. As a prepper it is important for us to examine these SHTF scenarios in order to learn lessons that will help to better prepare us. As I have read through the stories from evacuees and others on Facebook I’ve come up with 6 lessons that we can learn. 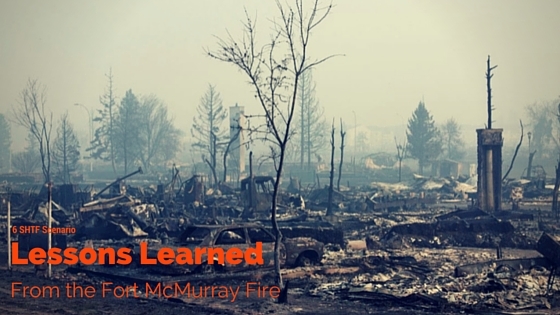 There are some disasters that we can be well informed of prior to being impacted. Such disasters include hurricanes, floods and sometimes even tsunamis. These are just a few examples. However, there are some disasters like this horrific fire that we cannot be fully informed prior to the impact. The thing about fires is that once they start they can burn up quickly. Once they grow big enough it is impossible to tame or control them. By the look of this massive fire it can overwhelm you. I was in awe by the looks of this beast. If I was caught in this disaster I would probably crap my pants. In SHTF scenario lessons like this we need to let our fight or flight instinct take over. We don’t have time to sit and worry about the situation. The more time we take to implement an action the more danger we face. In this case many people lost hundreds of thousands of dollars as their houses burned to the ground. It’s tempting to give up on everything as you watch your life’s hard work burn down forcing you to start over again. However, we need to have some sort of hope within us that will motivate us to keep pushing. My hope and motivation comes from the belief that “all things work together for good.” Whatever it is, you need to have some source of hope. If your mind and hope breaks down then you have already lost the battle. In a previous post I wrote about How to Determine When to Bug Out. There should be a plan for bugging out or even just to evacuate. Many times when we discuss bugging out it is with the intention of never returning. So I would encourage you to use the diagrams I put together to help you determine when or if you should bug out. If you are bugging out or not you need to have a plan put together. It sounds cliché but “if you fail to plan then you plan to fail.” You need have to your emergency preps ready at all time. This SHTF scenario teaches us that we need to add some sort of gas mask to our preps. For cheaper options you can buy the N95 respirators or other pricier options. As mentioned in the previous diagram, not every SHTF scenario is going to require a bug out location. In the diagram this scenario would fall under either the “Short-term recovery/locally affected” or “long term recovery/ locally affected.” So we would either need to get a hotel or move. There is a possibility of returning to your house or moving somewhere else in the same city. The challenging thing about this situation though is that many people are caught in the traffic jam of trying to evacuate. Plus, you are not sure how far this fire is going to grow and in what direction. This is why it is important to have an emergency rally point in at least 4 different directions. These locations can be friends’ and family houses or maybe even a rest stop. This would afford you enough time to wait out the traffic until you can get to a hotel. Now many affected by this disaster are going to be faced with a decision to move after seeing their house burned down. Hopefully many of these people have some sort of insurance that can help them rebuild. Otherwise they are going to be forced to move and rebuild. Some may even be homeless. To me this is the most challenging lesson learned. Not everybody can afford to have another house that they could move to if their house burns down. However, I don’t believe that is impossible. There are other options. Maybe you could have a small cabin or RV that you could live in while recovering from this disaster. We need to have backups to our backups. This includes houses. For those of us that can’t afford something like this we should probably consider adding an extra source of income to our lives. We can do side jobs or find investments. Many Canadians complained about the lack of timely communication about the disaster from the authorities. Not only was it not timely but some of it was inaccurate or didn’t provide enough information. So many were clueless on where to go. One consideration is to have a HAM radio especially for situations like this. At the time of the post at least 1,600 structures (including houses) were destroyed. What took many years to save and build took one day to destroy. Their dreams and memories were taken away from them without warning. No one is exempt for SHTF scenarios like this. We are seeing natural disasters occur more frequently. Even in a cold climate such as Canada can see thousands of acres burn from one fire. Feel free to leave your suggestions in the comment section below. Your feedback helps the prepper community.